A series of novel substituted 2-amino-5-(1-(4-isobutylphenyl)ethyl)-1,3,4-thiadiazoles were designed, synthesized and evaluated as anti-inflammatory and analgesic agents. Compounds were characterized by elemental and spectroscopic analysis. Compounds possessing significant activities were screened for ulcerogenic activity. Compound-5 (2-(4-isobutylphenyl)-N-(5-(1-(4- isobutylphenyl)ethyl)-1,3,4-thiadiazol-2-yl)-propanamide) produces significant in vitro antiinflammatory activity (72.5%) as compared to ibuprofen (47.7%), while compound-3f (2-(Ncyclohexyl- N-methylamino)-N-(5-(1-(4-isobutylphenyl)-ethyl)-1,3,4-thiadiazol-2-yl)-acetamide) showed 64.1 % activity. Results indicate that compound-4 (N-(5-(1-(4-isobutyl-phenyl)-ethyl)-1,3,4-thiadiazol-2-yl)-acetamide) exhibited highest analgesic activity (69.8%), where as compound-5 possessed 65.5% activity. Structure based drug design was also investigated to reveal the mechanism of action and specificity of our compounds against COX-2 enzyme. 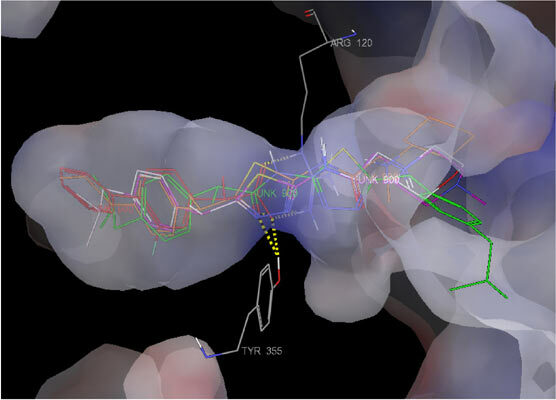 Anti-inflammatory activity and ulcerogenic potential were in agreement with the molecular modeling studies carried out on cycloxygenase enzyme. 1, 3, 4-thiadiazole, molecular modeling, docking studies, anti-inflammatory activity, analgesic activity, CADD, ulcerogenic potential. Faculty of Pharmacy and Medical Sciences, Al-Ahliyya Amman University, PO Box 263, Amman 19328, Jordan.